So the whole Hive story that dominated season 3 of Agents of S.H.I.E.L.D. didn't really hook me and I was pretty open to the possibility that it was time to drop the show from our active list of things to watch. I didn't quite drop it entirely since it was still part of the iflix library but I didn't really bother dragging Tobie into things. So I continued watching the show with very minimal expectations. The fourth season of Agents of S.H.I.E.L.D. was divided into three major story arcs - Ghost Rider, LMD, and Agents of Hydra. The titles of these segments alone were pretty intriguing but I was still worried that the show wouldn't deliver given by how much they had mangled their Inhumans storyline acrosss the seasons. But this season turned out to be pretty good, perhaps even among the best in the run of th show as a whole. They finally found a way to use comic book stories and characters more effectively while still remaining tied to the Marvel Cinematic Universe in a non-restrictive manner. Synopsis: Agents of S.H.I.E.L.D. is an American television series created by Joss Whedon, Jed Whedon and Maurissa Tancharoen for ABC. As of the time of this blog post, a fifth season is already in-progress. The season begins with Daisy "Quake" Johnson (Chloe Bennet) as a fugitive from the law. She continues to act as a vigilante hunting down the Watchdogs and trying to help fellow Inhumans when she can. But then we hear of reports of members of the Aryan Brotherhood being murdered by some flame-headed individual people have come to call the Ghost Rider. How hits all ties together is anyone's guess but with a force like Ghost Rider (Gabriel Luna), things are bound to get complicated. On the S.H.I.E.L.D. 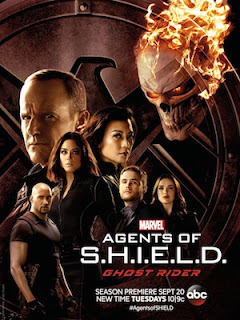 front, the new Director Jeffrey Mace (Jason O'Mara) forbids our S.H.I.E.L.D. protagonists from searching for Quake despite wanting to help a former colleague. At the same time Fitz (Iain De Caestecker) learns that Holden Radcliffe (John Hannah) has created an artificial intelligence android known as Aida (Mallory Jansen) and ends up agreeing to help perfect her programming. All the while anti-Inhuman sentiment remains rather high in the general community. What I Liked: In general the three big story arcs for this season were pretty good but LMD and Agents of Hydra really stand out as being some stellar stories. LMD truly felt like a story that was distinctly S.H.I.E.L.D. given the role LMDs have played in the comics and how they play on the classic suspicions of not being able to trust members of your team due to infiltration. This arc had a lot of great moments that I enjoyed a lot. Agents of Hydra was a whole new level of awesome in terms of the mind-bending plot that felt so out of this world. It was a great way to thrust our characters into a new status quo without really changing the status quo at the same time. That makes for a weird sentiment but that's really how the show struck me in this arc. I just can't imagine how they'll walk away from all this with the team still intact. What Could Have Been Better: The season started off a little wobbly as we were back to ranting about Inhumans and the whole dark magic side to the arc just took forever to build up into anything significant. Ghost Rider was a fun addition to things but still he wasn't quite awesome from the get-go. I'm still impressed at how much they did get to utilize him despite related costs for special effects for his head but the end result was still pretty good. I also don't quite understand why the team still thought working with the likes of Holden Radcliffe despite all that had happened before. His unusual relationship with Fitz just continued to compound the strangeness of things and it just felt like they kept him for the inevitable complications of his personality and his work. It was a bit contrieved but that's what happens when plot demands don't always make sense for individual character arcs. TL;DR: Agents of S.H.I.E.L.D. 's fourth season is one of the best in the show and has a lot of great fun for those who have stayed on this far. One can only wonder how they'll move forward and recover from the implications of the Agents of Hydra arc. Thus the season gets 4.5 surprise LMD replacements out of a possible 5.